As the United Launch Alliance (ULA) look forward to a potential surge in activity later this decade, the question of requiring additional launch infrastructure to cater for demand has led to discussions with the Kennedy Space Center (KSC). The discussions may result in Atlas V or Delta IV rockets launching from a former Shuttle launch pad at Complex 39. ULA currently launch satellites and spacecraft from both Cape Canaveral in Florida and Vandenberg Air Force Base in California. However, they are currently working with two commercial crew partners – Boeing and their CST-100 capsule, and Sierra Nevada Corporation (SNC), who are making progress on their Dream Chaser spacecraft. Both Commercial Crew integrated Capability (CCiCap) funding initiatives winners have already opted to launch on a human-rated version of the ULA Atlas V rocket, should they win the ultimate prize of launching American astronauts to the International Space Station (ISS) later this decade. At present, Atlas V’s launch from Cape Canaveral’s Space Launch Complex 41 (SLC-41), originally built as a Titan IIIC launch pad in the 1960s and subsequently the Titan IIIE and Titan IV. The first launch from the complex, then designated LC-41, occurred in December 1965, when a Titan launched the LES-3, LES-4, Oscar 4 and OV2-3 satellites. In April 1999, the last Titan launch from SLC-41 failed to deploy a Defense Support Program missile defence satellite. The complex was renamed Space Launch Complex 41, or SLC-41, in 1997, ahead of the fixed and mobile service towers being demolished in controlled explosions, beginning work to convert the pad for use by the Atlas V – debuting in 2002. 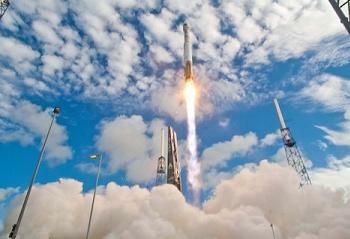 It will host its 29th Atlas V launch in late October, when OTV-3 is lofted uphill by the reliable rocket. 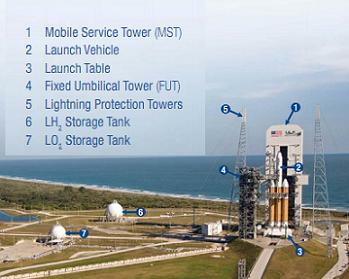 ULA also operate Space Launch Complex 37B (SLC-37B) at the Cape for their Delta IV vehicles. Originally built in the 1960s as a backup launch complex for the Apollo programme, it was used to test hardware which would be used in the moon landings. The first launch from the complex was of SA-5, the first all-up test of the Saturn I, and the first orbital launch of a Saturn rocket, on 29 January 1964. The last launch from the complex came in January 1968, when a Saturn IB launched Apollo 5; the first test flight of the Lunar Module in Earth orbit. Following the launch of Apollo 5, LC-37 was mothballed along with Launch Complex 34 ahead of the Apollo Applications programme, which would have seen additional flights of the Apollo spacecraft to Low Earth orbit, via the use of the Saturn IB. Construction of the new complex began in the late 1990s, with the first Delta IV launch from the pad occurring in 2002. The June Delta IV launch of the classified NROL-15 payload for the United States National Reconnaissance Office was the sixteenth Delta IV to launch from SLC-37B. With ULA a major player in the launch business, an expanding order book can be catered for within the confines of their current infrastructure. However, the company is aware they need to look towards the future, especially if they also become the launch provider for a commercial crew vehicle. “We still have a lot of untapped capacity in both the production and launch infrastructure. So we can increase rate by increasing staffing,” noted Dr George Sowers, ULA VP for Human Launch Services, during a Q&A session with NASASpaceFlight.com members. Taking another pad in the area – namely at Complex 39 at KSC – was also classed as an option by Dr Sowers, citing the studies and discussions that have taken place with the famous spaceport. Moving forward with such a plan would depend on the viability of such an agreement. Notes and graphics from the studies were acquired by L2 (LINK) earlier in the year, showing an integration path involving an Atlas V being stacked inside the Vehicle Assembly Building (VAB), atop of a former Shuttle MLP, prior to being rolled out to Complex 39. Such an arrangement is part of KSC’s drive to become a multi-user spaceport, allowing for dual flows inside the VAB for both a commercial vehicle and the Space Launch System (SLS) – with work ongoing at this time to remove and replace platforms that were dedicated to the Shuttle stack. The Kennedy Space Center’s Ground Systems Development and Operations (GSDO) program recently noted how they expect to transition their three MLPs, with MLP-1 set to retire, MLP-2 to be dedicated to a liquid fueled vehicle – such as Atlas V, and MLP-3 to be used by a Solid Rocket Motor vehicle – such as the Liberty rocket. With SLS taking over the former Ares Mobile Launcher, the overall plan fits with the range of potential vehicles that could utilize KSC as their home port. Previous comments that Liberty would require a second Ares-style ML no longer apply for the short to medium term, with source information noting ATK are now planning to concentrate on unmanned payload missions, as opposed to crewed flights – after missing out on the CCiCap funding – launching the vehicle from a modified platform (MLP-3). The plan – should Liberty progress – would be to host the vehicle on one of the SRB Hold Down Posts (HDPs) previously used by a Shuttle booster, next to a minimal umbilical tower, per source notes (L2). 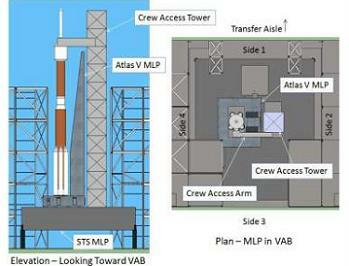 For Atlas V, a standard Atlas MLP would be placed over one of the SRB HDPs locations (Side 4) on MLP-2. 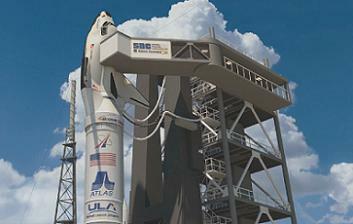 The Atlas V – with graphics depicting a human rated vehicle with notional spacecraft on top – would then be integrated on to its standard launch mount. 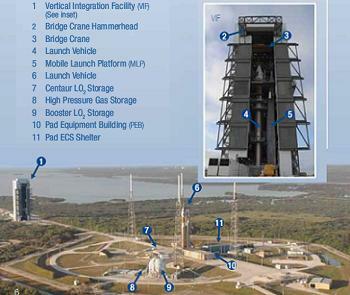 A crew access tower would then be built over the location of the other SRB HDP, rising above the Atlas V MLP and reaching over – or around – to allow for access to the spacecraft the Atlas V was tasked with launching. The entire set of hardware and rocket would then be rolled out of the VAB by the Crawler Transporter (CT) likely to Pad 39B – a clean pad capable of hosting both commercial crew vehicles and SLS. 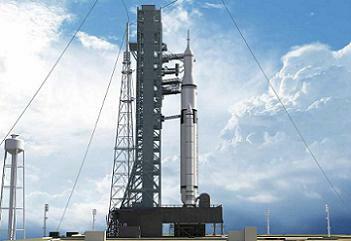 Should this option become a reality, both Dream Chaser and CST-100 would not have far to travel for their mating operations with the Atlas V. CST-100 has already agreed a deal to be processed inside the former Shuttle Orbiter Processing Facility (OPF-3), while SNC are close to deciding on a KSC facility to host their spaceplane.